Multi-Story Ministry Center in Jicamarca. "In 2008 when we first started coming to Peru, we began looking for property. Nine years later, in 2017, God brought a tremendous opportunity to us--a 1.25 acre lot with an existing structure that has the ability to support 6 floors. The first floor has been completed, along with water, electrical, and sewer, which gives us 7,200 sq. ft. of space ready to use. We feel the Lord is prompting us to keep the first floor as a church location for Sin Frontera Iglesia (Without Borders Church). Additional floors will be used for children's and youth facilities, bathrooms and showers, dormitories, and more. Among many other benefits like travel efficiency and storage facilities, having our own headquarters locally will also allow our administration to be financially self-sustaining. Visiting groups will be able to secure low cost living quarters and meals on-site rather than having to book much more expensive accommodations 2 hours away in Mira Flores. These funds then help provide additional resources for the ministry and local community. 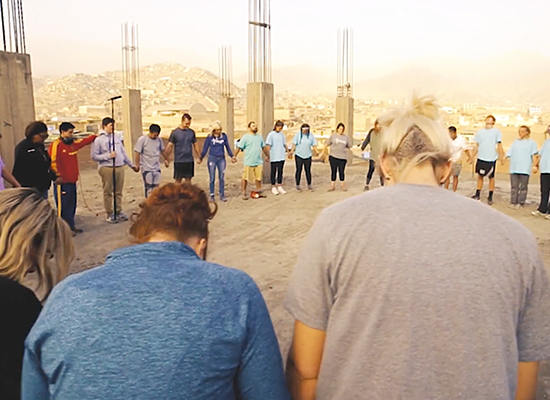 Thank you for partnering with us as we build hope in Peru! OUR GOAL is to complete 6 floors. The 1st floor was completed in 2006, giving us 7,200 sq. ft. of usable space. Set on 1.25 acres in the heart of Jicamarca, we're positioned for tremendous impact in the community. Plans are to include a soccer field on the 1.25 acres. $280,000 needed to finish 2nd & 3rd floors. Construction estimates have come in at $140,000 for the 2nd floor and $140,000 for the 3rd floor. The 2nd floor will have a kitchen, dining room, dormitories, and bathroom facilities with showers. This floor will also serve as a meeting area so that our summer missions teams have a quiet place to pray and plan. The 3rd floor will host additional dormitories and meeting rooms so that our visiting missions teams do not have to stay hours away in Mira Flores. On average we have over 100 volunteers coming to Jicamarca every summer, as well as smaller teams coming throughout the year. In total, this structure was engineered to support 6 floors, giving us room to expand to 3 additional floors over the upcoming years. We're already dreaming about the possibilities of medical/dental facilities and additional offices to facilitate our Reimagine Peru staff, interns, and volunteers. "Is this a God opportunity or a good opportunity? It's both."